Mobile is no longer a luxury, but a necessity. Toptal’s mobile application development services deliver custom mobile experiences for your iOS, Android, and cross-platform needs. Bypassing native development can help speed up time to launch but requires top individuals to do properly. Minimizing the impact on UX is crucial in order to maintain and satisfy users. If done successfully, developers can fully utilize the capabilities of native platforms while also sharing business logic across them. Working in iOS offers the ability to work across three main devices—iPhone, iPad, and Apple Watch—with unique potential in each area. Toptal developers have cracked the top 10 in the App Store and have worked in all areas including games, fintech, business apps, and more. Integration with hardware provides a whole new set of opportunities for companies, whether they are developing an app specifically for hardware or simply extending functionality. Especially in the rapidly growing VR / AR space, Toptal specialists can help unlock new potential. Whether in home automation, smart healthcare, or more, the Internet of things (IoT) has brought a whole new wave of technology that can be accessed through mobile applications. Develop high functioning apps with hardware interactions through Wi-Fi, Bluetooth, Near Field Communication (NFC), and more. Agile app development provides a chance to build a product while learning best practices. Work with mobile app developers who are also specialists in Scrum, Kanban, XP, and Lean Software to hone or improve your own agile skills. See how Toptal's mobile development experts have helped our clients develop amazing mobile app solutions. Here is what Toptal's leading mobile app experts are saying about application development for mobile devices. With the advent of the iPhone in 2007, mobile apps—software applications designed primarily for smartphones and similar devices—became one of the most important areas of software development. Estimated now at roughly $100 billion, the global app economy has grown rapidly and shows no signs of slowing: Publisher revenue increased 40% in 2016, a faster rate than the previous year. This is largely driven by increased use, with consumers downloading more and spending a greater amount of time on apps. But this is not just a demand story. With more than 12 million mobile app developers, the space has seen rapid advancement in development techniques. This includes the emergence of new languages like Swift, frameworks like React, and IDEs like AppCode from JetBrains. Top mobile app developers tend to specialize in one of the two primary platforms—Apple’s iOS or Google’s Android—as they have slightly different features and unique challenges. With this concentration of developers and focus, today’s apps are better and more sophisticated than ever. Mobile isn’t going anywhere. The average American consumer now spends more than five hours a day on his/her phone and navigates across more than 30 apps in any given week. As the app economy grows steadily, this use is also translating into significant revenue generation. Even if a company isn’t directly trying to sell a phone app, exploiting the potential of mobile is of critical business importance: Mobile accounts for almost half of all online retail traffic and at least 30 percent of all online sales. Aside from the cumulative impact it can have on any business, custom app development has several direct benefits. New presence and new traffic: Each app has a description area that can contain information about the seller, as well as a link to the developer website. New source of customers. 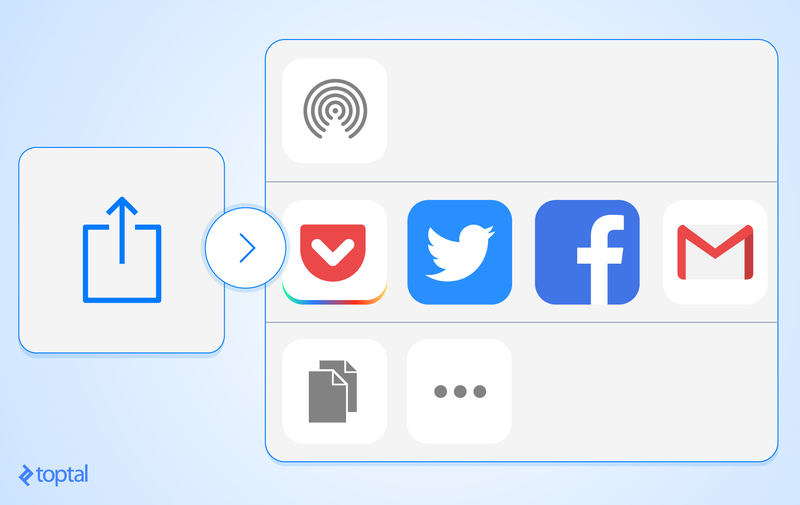 For example, once someone finds your app useful, they can use in-store embedded “share” functionality to let their friends give the app a try instantly via email, SMS, social media, and other channels. New platform to gather reviews and ratings from your customers. This can supplement your company’s Google Maps listing and direct client processes and/or custom developed tools. Create a direct channel to the customer. An app with basic functionality can be distributed for free, with advanced features or subscriptions available through in-app purchases. This will let more users discover and install the application. Connecting to customers through their smartphones also means being able to communicate directly with them when you want to. This targeted method is less crowded and thus more effective than email and other channels. In some markets, this can even be a path to embed into people’s leisure time, as the New York Times did with their crossword app. A mobile phone is one more gadget through which you can connect with your customers. Used on the go, it unlocks new ways to reach its owners, build good rapport, or start a new sales opportunity. Once someone visits your website from their mobile phone, show them an app banner, so they can install the app in a single step. Once done, the app works as a bookmark, even if not currently used: People tend to install interesting apps with the intention to use them some day. So, next time a particular problem needs a solution that you can provide, your installed app will work as a reminder about your service. Contemporary mobile devices also integrate well with user credit cards and bank accounts. For example, with Apple Pay, it is easy for them to make an instant purchase with the touch of a finger: An effective means to trigger more sales. Equally importantly, an app can integrate with mobile messengers, like iMessage or Facebook Messenger. Fueled by rich text and media, these channels can be leveraged from an app for social notifications, collaboration, and sharing. Embedding a brand into people’s day-to-day communication flows like this is a surefire way to multiply customer opportunities. User experience (UX) is key to the competitiveness and potential virality of a mobile app. But how can you improve your app’s UX to help it become popular? Enhance existing functionality when used from a mobile phone. For example, your store/hospital/shopping center app with a map and position tracking will make it easy for users to find goods and services on the premises. Make the app available for free with basic features, and add advanced features through either one-time in-app purchases or a membership subscription. A free app will work as a tool to build loyalty and rapport. Where regular data entry is needed, think about how you can simplify it using the advantages of a mobile device. For example, Apple’s Health application makes it easy to automatically record data such as steps walked throughout a day, or track heart rate, blood pressure, and other measurements with a few taps. As people carry their phones around, the simplicity of logging progress and accomplishments will make them use the app more often. Plan social campaigns and let your app spread virally by utilizing access to your customer phone contact list—it is usually a few clicks away. For example, Dropbox allows you to invite a friend of yours to use their service. In return, they give both of you additional storage. Improve your application by accessing user data only tracked by and available on their phone. Those are, to list just a few, health records and daily activity measurements. Simplify usage of your service by fetching media directly from the user’s camera roll. For example, Animoto makes it possible to select photos and launch video rendering straight from their mobile app. Add speech recognition. This is made available for developers in both Apple iOS and Android. A few tips and tricks will help you determine which mobile platforms to develop for, and which features will make the most difference when programmed into your mobile app. Learn from your existing analytics. Chances are, your business already tracks customer activity using technology like Google Analytics. By looking at various reports, you can get instant answers to the following questions: What percentage of your customers use smartphones? Which ones? Android or Apple? Which browsers are most used? Safari, Google Chrome, or Mozilla? Ask your existing customers how they would use your service as a mobile app. One example is FormAssembly, a form-building and data collection service that once was online-only. Their customers asked the company for an offline application for two particular needs: Collecting signatures and collecting registration information to tracking interest at events with their mobile devices. As a result, after releasing a mobile application, the company grew their customer base. Search for existing mobile apps by keywords and make a feature comparison table; then find a niche where you can compete even with a minimum viable product (MVP). The idea here is to ship a combination of features that no other service combines in their mobile apps. For example, if your business is a restaurant, besides just booking tables and taking orders, your mobile application could integrate with Uber and UberEATS. Find practical applications of mobile-only features in your services, i.e., understand how you in your app can implement functionality that wouldn’t be possible without mobile hardware. Create a table with two columns: “Mobile Feature” and “Feature Application.” In the first column, list mobile-only features: GPS, gyroscope, camera, access to the phone owner’s contact list, light sensor, microphone, and so on. In the second column, write down which existing or new features of your service/website can utilize mobile-only features, and how. When it comes to decision-making, these current mobile development trends will help you stay more informed and discuss app development more fluently with developers. Many complementary services can simplify and speed up mobile development: Mobile App Data and Simple Queue Service from Amazon, push notifications delivery services like the one from OneSignal, SMS gateways like BulkSMS, Artificial Intelligent (AI) services, like image recognition and analysis by IBM Watson Image Recognition, text analysis by Salesforce Einstein, or voice recognition by Microsoft AI; file storage and synchronization like from Dropbox; or online databases, media storage, and key-value pair storages like ones built by Amazon. Apps can be developed once and shipped to multiple mobile platforms with the help of frameworks like React.js and Xamarin, so there’s no need for separate Android app development and iOS app development. Many routine input processing tasks can be done via artificial intelligence—skim more than 100 APIs available in the ProgrammableWeb directory. Bots can be developed on platforms like Telegram and Facebook Messenger. Payments can be taken in mobile apps through services like Apple Pay, Stripe, and PayPal. With the explosion of apps, users have countless options and thus higher expectations. How can you hope to satisfy them? Whether your app has a detailed roadmap or is just an idea, now is the time to connect with an experienced developer to discover the possibilities for your business. Working with elite, senior developers is the only way to ensure quality, help distinguish your app, and maximize your opportunity in mobile.